Kraemer reconstructed the interchange at I-494 and TH 169 as the design-build contractor leading this urban interchange reconstruction project through the Minneapolis Metro Area. The project included connecting the north and south frontage roads under TH 169 and converting TH 169 from an expressway to a freeway with a partial direction interchange at I-494. Additional work included environmental coordination, public relations and the coordination of $17 million in private utility relocations. The project included nine new bridges, including three curved steel flyovers, three bridge widenings, grading and surfacing of five miles of TH 169, 10 ramps, six roundabouts, water quality ponds, lighting, signing and 122,300 SF of retaining walls. 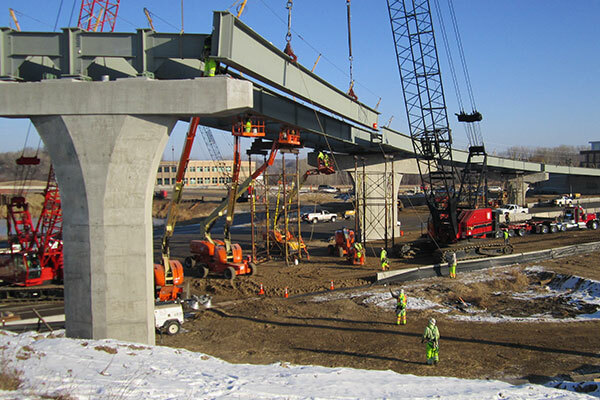 The design-build team worked together to develop several cost-saving innovations, including shifting a ramp location to eliminate the need for a new bridge. This collaborative effort and innovation saved the project $5.9 million. The project was substantially completed and opened to traffic by November 2012 per the original schedule and 10 months ahead of the contract allowable completion date, despite a government-mandated shutdown that stopped the project for 24 days.